A puzzle: why did Microsoft hold back Windows RT previews from developers? Surface RT is out, along with a few other Windows RT devices such as the Asus Vivo Tab RT, and for most people (developers included) it is their first opportunity to have hands-on time with Windows 8 on ARM. What is odd here is that at the same moment that users can try (or in some cases buy) apps that those same developers have built, on Windows RT. The idea was that if you code for the Windows Runtime, which is common to both Intel and ARM versions of Windows, then the same app will just work. Microsoft’s store process ensures that apps which do not work at all on ARM – such as those which include x86 native code – are not listed for download on Windows RT; but these other apps which work, but not well enough, have generally been made available. The puzzle is why Microsoft did not offer developers some kind of preview hardware, such as RIM makes available for Blackberry 10, so that these issues could have been addressed, either by fixing the performance with further optimisation, or if necessary by marking apps as x86 only. As it is, the developers of these poorly-performing apps will get the blame for a problem that is not of their making. Microsoft’s BUILD conference has kicked off in Redmond with a keynote featuring CEO Steve Ballmer, Developer evangelist Steven Guggenheimer, and Kevin Gallo from the Windows Phone team. There were also a few guest appearances, including Tony Garcia from Unity, a cross-platform games engine. The company has a lot to talk about, with Windows 8 just launched – four million upgrades sold so far, we were told, which seems to me a middling OK but not great result – and Windows Phone 8 also fully announced for the first time. 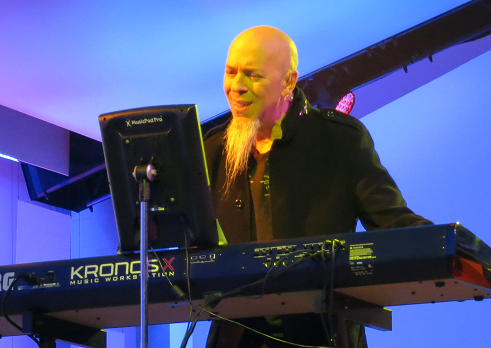 The keynote opened with a performance by Jordan Rudess from Dream Theatre, enjoyable and somewhat relevant given that he has helped create two music apps for Windows 8, Morphwiz and Tachyon, which he talked briefly about and played on a Surface RT and Lenovo desktop. Then Ballmer came on and gave what I can only describe as a hands-on tutorial in how to use Windows 8 apps. I found this odd but it was well received; my conclusion is that many people have not bothered to look closely at Windows 8, or have been put off by the Start menu issue, and much of what Ballmer showed was new to them. It was not to me, so I was not gripped by this section of the keynote. I preferred the presentation from Steven Guggenheimer; most of what he presented is also covered here, and included the announcement of forthcoming Windows 8 apps from Disney, ESPN and Dropbox. The Dropbox announcement is particularly significant, since I have heard complaints about its absence from Surface RT, which is unable to run the usual desktop client for Dropbox. Another app that is on the way is from Twitter. Guggenheimer also described a new PayPal API for Windows Store apps. I do wonder why key services like Dropbox and Twitter are only now announcing Windows 8 apps. Windows 8 has been available in preview versions since last year’s Build event, and has not changed that much as a developer platform. Gallo introduced some of the new features in Windows Phone 8, and claimed that Microsoft has delivered the majority of developer requests in the new Phone SDK which is available from today. He emphasised the possibility of sharing code between Windows Phone 8 and Windows 8, using Visual Studio to ensure compatibility. Garcia presented Unity for Windows Phone, which is potentially a big deal, since it is widely used. The demo of immersive gaming graphics on Windows Phone 8 was impressive. 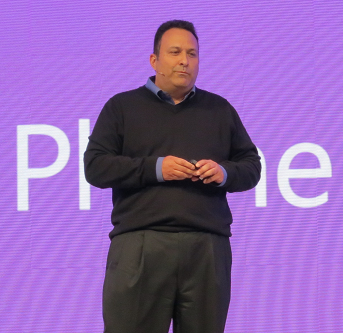 Finally, Nokia’s Richard Kerris came on, mostly to announce a giveaway of the new 920 Windows Phone 8 device for Build attendees. This raised a loud cheer as you would expect, though it may be significant that the free phone won an even warmer reception than the earlier announcement of a free Surface RT. The cost of signing up for a Windows Phone developer account has been reduced to just $8.00 for the next few days; see here for more details. Did Microsoft do enough in this keynote? Personally I would like to have seen more technical depth, and a more convincing presentation of why the company thinks these new devices have what it takes to take on Apple and Google. Still, this is all about partners, and the arrival of Dropbox and Twitter as Windows 8 apps, and Unity for Windows Phone 8, are all significant events. The Samsung slate was 5.11 times as fast. Question: how much of that is down to the Core i5 being a faster CPU, and how much is down to a less well optimized Chakra engine? 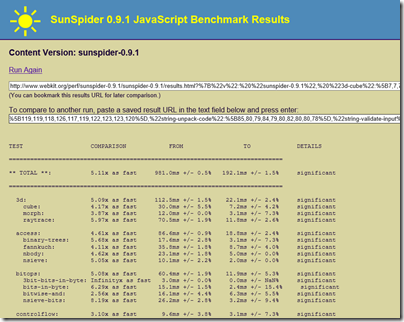 Incidentally, the Apple iPad 2 which has an Apple A5 processors running at around 890 Mhz is approximately 33% slower on the SunSpider test. 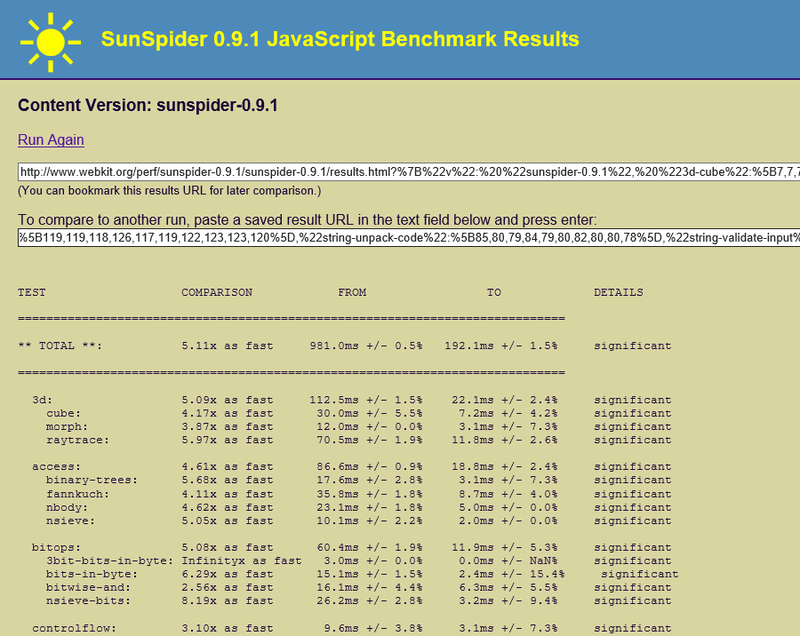 Since the CPU is clocked 45% slower that is a good result for the iPad 2 and Safari. A Google Nexus 7 on the other hand which has the same Tegra 3 chipset as the Surface is about 55% slower than the Surface, which is poor. 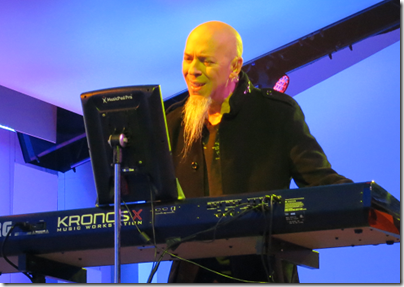 Microsoft’s problem – and its solution? Looking through my snaps from Microsoft’s Times Square launch of Windows 8 and Surface RT, I was struck by this image of a man capturing the event on his Apple iPad. The picture was snapped in New York City on Wednesday 25th October 2012. 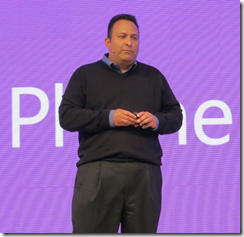 Windows Phone 8 launches: is it enough? Microsoft has launched Windows Phone 8 at a press event in San Francisco, streamed around the world. Joe Belfiore presented the new features in his usual enthusiastic style (complete with kids on stage to show Kids Corner), and the phone was endorsed by CEO Steve Ballmer and celebrity Jessica Alba. Data Sense is for optimizing (ie reducing) mobile data usage and offers visibility about which apps are using data and how much, as well as a data compression feature that enables up to 45% more web browsing for the same amount of data transfer. The compression feature requires operator support and some details are not yet clear. People hub has “Rooms” which let you group contacts, a feature that seems close to what Google+ offers with circles, though Microsoft also has a limited sharing feature that lets trusted contacts see a Room schedule on an iPhone. Kids Corner lets you create a kind of secondary login for children, with apps, games and music that you select. Your normal Start screen is protected by a password, so no embarrassing calls or tweets. 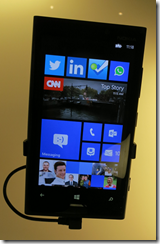 Apps can now display content on the lock screen and integrate into hubs and with Windows Phone Wallet. More apps are coming, and Belfiore told us that 46 of the 50 most popular apps across all platforms are available for Windows Phone 8. Pandora, Urbanspoon and Temple Run got a mention. There is an iTunes import feature which will copy unprotected music from iTunes to SkyDrive for use on the phone and with Xbox Music. 7GB SkyDrive cloud storage comes for free. OneNote has a new voice transcription feature. This was not an event for developers, though we did learn that the SDK will be made available to everyone from tomorrow 30th October. Phones themselves will be available from this weekend in Europe and from November 14th in the USA. I got a quick look at the HTX 8x, and was struck by how slim it is, with a 720X1280 4.3″ screen. It is curved at the back and has a quality feel, though I am not sure HTC quite matches Nokia for hardware design. 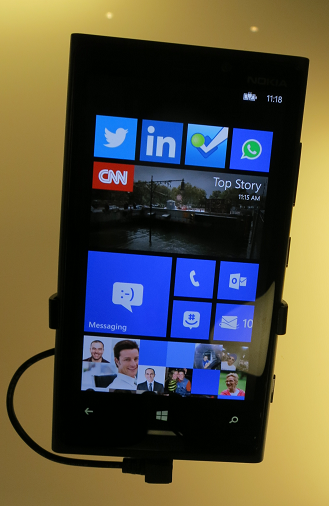 I like Windows Phone and there are some tempting new features here. Will this improve Microsoft’s market share and Nokia’s fortunes? This may sound like ducking this issue, but I do not think the fortunes of Windows Phone depend on its features or even the quality of the phones. It is all about operator and retail partnerships, and what customers get told when they walk in to buy a phone and a contract. Windows Phone launched to near-invisibility on the high street. Matters have improved a little since then, especially after Nokia came out with the Lumia (Ballmer said that Nokia sells more Windows Phones than any other vendor), but Microsoft’s phone was still an also-ran after iOS and Android. 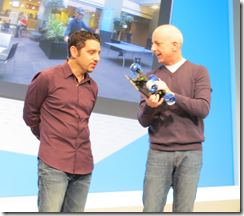 How does Microsoft get into those in-store conversations, yet alone win them? I also think Windows 8 is a factor here. If devices like Surface RT are popular, then Live Tiles and other elements of Windows Phone 8 will become familiar. On the other hand if Windows 8 users rush to install substitute Start menus and ignore the new app platform, not much will have been achieved. Microsoft has released Surface RT, its first own-brand PC (if you can call it that) and also one of the first few devices to run Windows on ARM, formally known as Windows RT. I have been using Surface RT with the “Touch” keyboard cover intensively since its launch; it is a fascinating device, and the reactions to it from early purchasers is also interesting to watch. Surface has various problems. It is designed for the new-style apps called Metro, or Windows Store apps, but the truth is that the selection of apps currently available is small and many are trivial or poor. There are many gaps. On the other hand, I have found workarounds for most issues, and there is plenty to like too. This is the first release of Windows on ARM. I have not found Surface particularly buggy or slow, but I would guess that performance will improve and bugs will be fixed as updates flow. This is Windows 8, which is unfamiliar to many. It is not unfamiliar to me; but my guess is that for someone new both to Surface and to Windows 8, there will be some initial struggles. This will get better as users become more familiar with the operating system. Better apps will come. 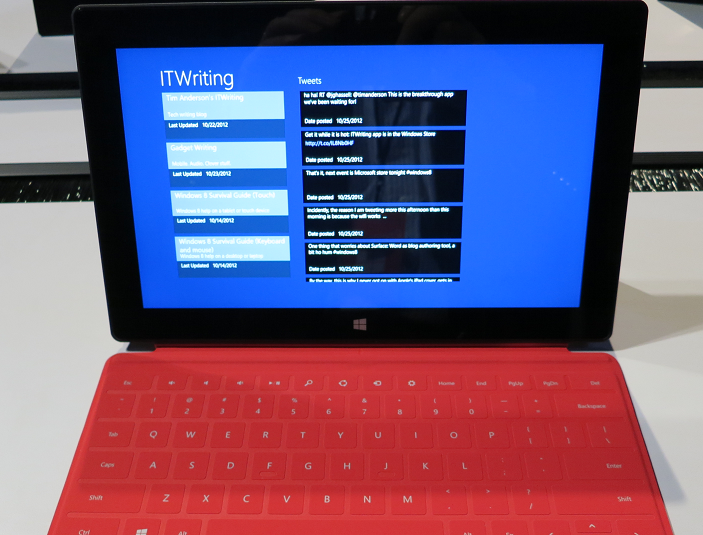 Most developers are now seeing Windows RT for the first time; and it is remarkable that apps built for x86 Windows – like the ITWriting app – work as well as they do on ARM. On the other hand, I have also heard of performance issues, and certainly Pinball FX2 seems less smooth on Surface than on a Core i5 (not a surprise). Here are a few details. Password management. I use Password Safe, which does not run on Windows RT. I resorted to VPN and Remote Desktop to another machine to use Password Safe. There are some Windows Store password managers and I need to investigate; ideally I need one which supports Password Safe import. Live Writer. My preferred blogging tool does not run on Surface RT. I am making do with Word. The only other option I know of is to post through the browser (self-hosted WordPress). SSH connection. As part of the setup for blogging with Word, I needed to make an SSH connection to a Linux server. There is an SSH app for Apple iOS, but not for Surface. Not knowing any other way, I went the Remote Desktop route again. Printing. I am staying with a friend and needed to print a boarding pass. He has a shared printer attached to a Mac. Windows RT found the printer, using the old-style Control Panel, but gave a message about a missing network driver and to consult my administrator. Next, it gave me a driver selection dialog and I picked one I thought might work. It seemed to install, but when I tried to print, I got nothing: no error, but nothing printed either. Windows Update. I discovered that the final version of Office 2013 is available through Windows Update. I used Control Panel to find it. The update, which had to be selected manually, gave me an installation error. I looked this up and discovered it was because the Office Upload Center was running – thanks to my making a connection to SharePoint earlier. I terminated the Upload Center. Then the update failed with a different error. Now I am in limbo with this; Office 2013 final seems to be installed, but it is not listed in update history except as a failed update; however I cannot remove it nor reinstall it. Send As missing in Mail. The Mail app is working for me, connecting to my self-hosted Exchange server. However I make use of Send As in order to send mail as a different user. This works in Outlook but not in Mail. The workaround is to use Outlook Web Access, which does support Send As. The hardware seems excellent. I love that the Touch keyboard gives me the ability to type at a decent speed and use a trackpad, but without adding significant bulk. I like the solid feel of the device and the kickstand. I am also realising that the reason Microsoft talks so much about the hardware is that there is less to show off about on the software side. Skype. I have made several phone calls with the new Metro Skype client and it has worked very well, even without using a headset. Music. Microsoft handed out Xbox music passes to early Surface customers. The music app works, and while I do not love the user interface, there is a lot of music available to stream. USB. I’ve plugged wireless mouse adapters and storage devices into the USB port and they have worked fine. Battery life. I debated whether to put this as Good or Mixed. I’d like longer, but at 8 hours or so it is decent. A good sign is that Surface seems to run nice and cool. No fan needed, so it is silent too. Office and SharePoint. The presence of Office makes a huge difference to how I use Surface. 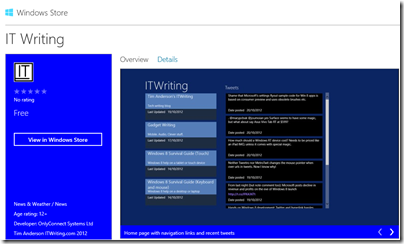 One thing I managed to do was to link up Explorer with my self-hosted SharePoint so I can easily open documents there. Unfortunately the way to do this is not something you are likely to discover by accident, but it does work, although with more prompts than I would like. Split/Snapped view can be very useful. For example, Mail app docked while working on the desktop. Windows desktop. I find I spend a lot of time in the Windows desktop. Applications I use regularly include not just Office but also Paint, Notepad, Explorer, Control Panel, Snipping tool, VPN and Remote Desktop. These apps greatly increase the usefulness of the Surface; but it should not be this way; ideally I should be able to get most things done in the Metro user interface. Desktop apps still have the problems that Windows has always had, like the ability to throw up mystifying and useless error messages such as the one from Word shown above. 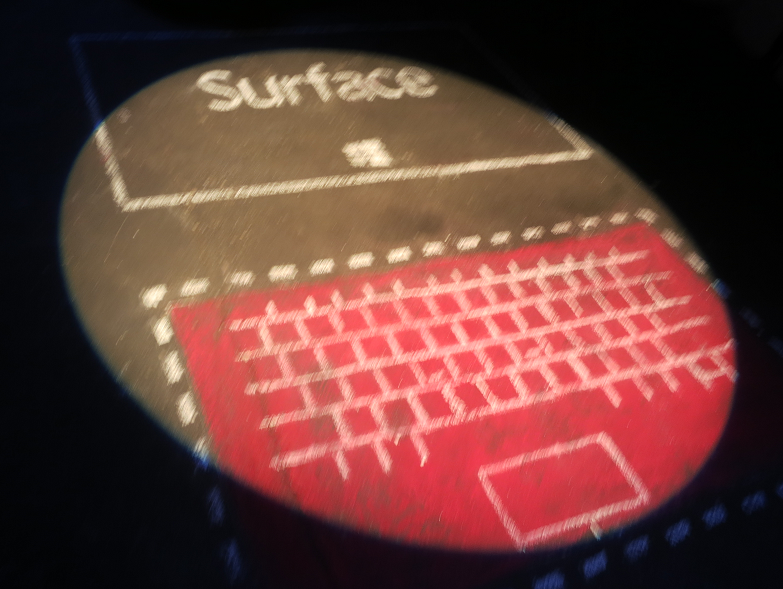 Surface cannot be the true breakthrough device it needs to be until that is the case. Performance. Generally I have found performance fine, and slowness when it occurs usually the fault of a slow internet connection or site. It could be snappier though, and I am not sure how good it will be with long Word documents or large Excel spreadsheets. If you resize the Word window, you can see a slight delay as it repaints. Some apps seem slower than they should be; I have had problems with Tweetro, a Twitter client, though this may be partly due to issues with the Twitter API. An Atom windows 8 machine I tried at an HP event was more sluggish than Surface; but who knows, perhaps that was an issue with that particular device. I intend to do some measuring to get a better understanding of this. Price. By the time you have added a keyboard cover, Surface is expensive considering its specs. The quality of design and manufacture, and the inclusion of Office, mitigate that; but current price levels will limit the market. Surface is a step forward for Windows, but this is a journey and the device as it is today does not fulfil all its promise. Even as it is though, it is highly capable and will probably get a lot of use from me as a device that does enough to make carrying a laptop or x86 tablet unnecessary. I recognise that some of that utility is only possible if you have knowledge of Windows, a flaw which needs Microsoft’s urgent attention. I like the fact that you cannot install desktop apps, despite its inconvenience, not only for security and stability, but also because it forces Microsoft and its users into the new Metro world. The worry is that so far Microsoft has failed to convince most software vendors and developers that this new platform is worth their attention. If that does not change, then Windows will continue its slow decline. I like Surface RT though; it deserves to succeed, and I will be interested to see if a significant community gets behind it and make it better. I generally post to this site using Windows Live Writer. Unfortunately this does not run on Microsoft’s new Surface tablet, since it is a desktop executable and Windows RT only allows Windows Store apps to be installed. So how to blog? This site runs WordPress, and of course you can post using the browser. However I prefer to use an offline editor, and the only choice in this respect that I know of is Microsoft Word. I looked at this years ago and decided it was poor; but needs must. One of the issues with using Word is that while it can connect successfully to the WordPress api for posting, it cannot apparently post images using the WordPress upload API – though if you know a way of configuring Word for this, please let me know. It does support FTP, so I set up an FTP server for this purpose. I did all this on the surface, though in order to make an SSH connection to the web server to sort out the DNS I resorted to VPN and Remote Desktop so I could use Putty, another Windows utility that does not work on Surface RT. If you can see the image above, then it worked. I have been surprised by how much of the Windows 8 desktop is present in Windows RT. I had been expecting something more cut-down, to support Office, Explorer, Control Panel and a few other utilities. In fact, it seems to me pretty much the desktop we are used to, though there are differences such as the inability to join a domain. Here are a few screen grabs. Control Panel is here, though despite the presence of Office 2013, it claims that no programs are installed. PowerShell is there – interesting, since you could write your own desktop utilities as scripts, making the desktop less locked down (and possibly less secure) that I had expected. The Windows Scripting Host is here too. Incidentally, for screen grabs the Snipping Tool is present. There is no Print Screen key on the touch keyboard cover, but this works fine with a Bluetooth keyboard (I don’t have a Type keyboard). I’m intrigued by the presence of Windows Easy Transfer. Who might be upgrading their PC to Windows RT? Not quite everything is here. There is no Windows Media Player; you have to use the new-style apps. Regedit is here, and prompts for UAC elevation just like on x86. Remote Desktop Connection is here. So is VPN connection, which works fine for me from the USA to my ISA Sever in the UK, but will depend on your setup (I am trying to clarify this point). Broadly, everything seems to be here other than a few bits Microsoft chose to pull out. I had thought the reverse would be true. 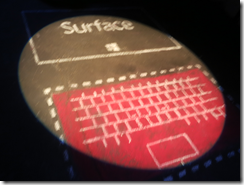 Note: I attempted to write this post on Surface with Word as the blog authoring tool, but got stuck with the images. Live Writer is far better, which is a concern. I am in New York for the launch of Windows 8. This morning was the general launch; the Surface RT launch is to follow this afternoon. 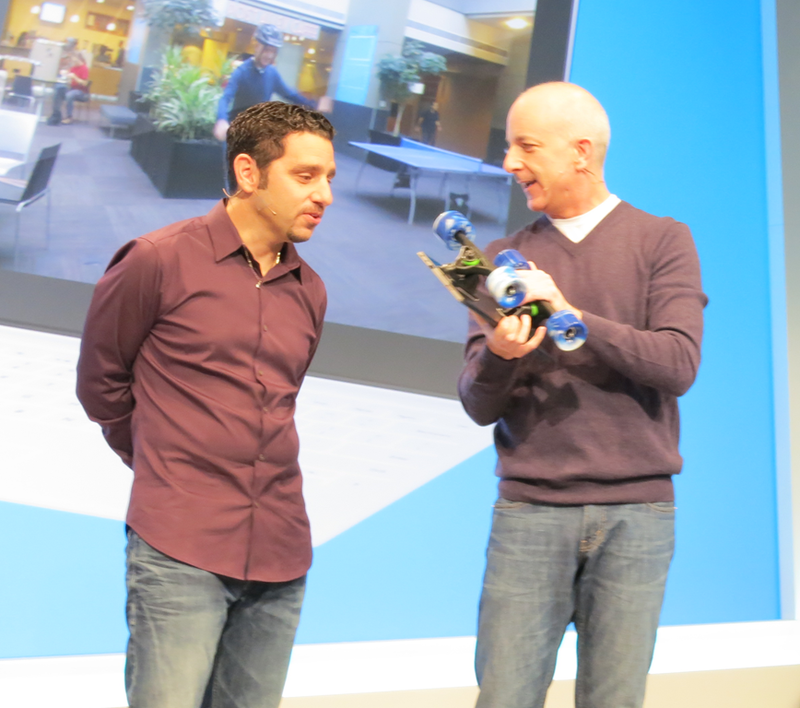 Windows chief Steven Sinofsky introduced the event. I was intrigued by how dismissive he was about a key Windows 8 issue: the learning challenge it presents to new users. He gave the impression that a few minutes experimenting will be enough, though he also referred to a guide that may be new; yesterday I picked up a small booklet which I had not seen before, introducing Windows 8. Next Microsoft’s Julie Larson-Green and Michael Angiulo came on to show off a few details about the Windows 8 user interface, followed by Ballmer who gave what is for him a muted address about how great Windows 8 is going to be. Solid facts were few, but Microsoft did mention that over 1000 devices are certified for Windows 8. So what is Windows 8 all about? It’s a tablet, it’s a laptop, it’s a PC we were told, in other words, everything. But everything is also nothing, and my sense is that even Microsoft is struggling to articulate its message, or at least, struggling to do so in ways that would not offend key partners. Personally I like Windows 8, I find it perfectly usable and appreciate the convenience of the tablet format. That said, I look at all these hybrid devices and my heart sinks: these are devices that are neither one thing nor another, and pay for it with complexity and expense. Will they win over users who might otherwise have bought a MacBook? I am doubtful. Windows RT and Intel Atom devices are more interesting. If Microsoft and its partners can push out Windows 8 devices that inexpensive and work well on tablets without keyboard clutter, that is what has potential to disrupt the market. That brings me on to Surface. It is all in the body language: the conviction that was missing from the Windows 8 keynote in the morning was present in the Surface keynote in the afternoon. Even the room was better, with stylish Surface fake pavement art in the corridor and smart white seating. General Manager Panos Panay showed off little details, like the way the rear camera angles so that it is level when the Surface is set on its kickstand. He talked about Microsoft’s drop tests, claiming that they had tested 72 different ways to drop a Surface and designed it not to break. He demonstrated this by dropping it onto a carpet, which was not too challenging, but the fact that Sinofsky successfully used it as a skateboard was more impressive. No doubt then: Microsoft has more enthusiasm for Surface, described by Panay as “the perfect expression of Windows”, than it does for the 1000 certified devices from its partners, though the company would never admit that directly. What is the significance of Surface? It goes beyond the device itself. It will impact Microsoft’s relationship with its hardware partners. It embodies an Apple-like principle that design excellence means hardware designed for software designed for hardware. It shows that the “OK but nothing special” approach of most Windows hardware vendors is no longer good enough. If Surface is popular, it will also introduce demand for more of the same: a 7” Surface, a Surface phone, and more. Despite its quality, the success of Surface is not assured. The biggest problem with Windows 8 now is with the lack of outstanding apps. That is not surprising given that the platform is new, and you would think that users would make allowance for that. On the other hand, they may lack patience and opt for better supported platforms instead, in which case building app momentum will be a challenge. Hands on where possible is part of my technical journalism philosophy, so I have been trying out Windows 8 development for some time. After playing around with and adapting Microsoft’s blog reader sample I decided to take it further and try submitting it to the Windows 8 Store. Today it was certified so you can install it now. It is free of course. There is not much to it. 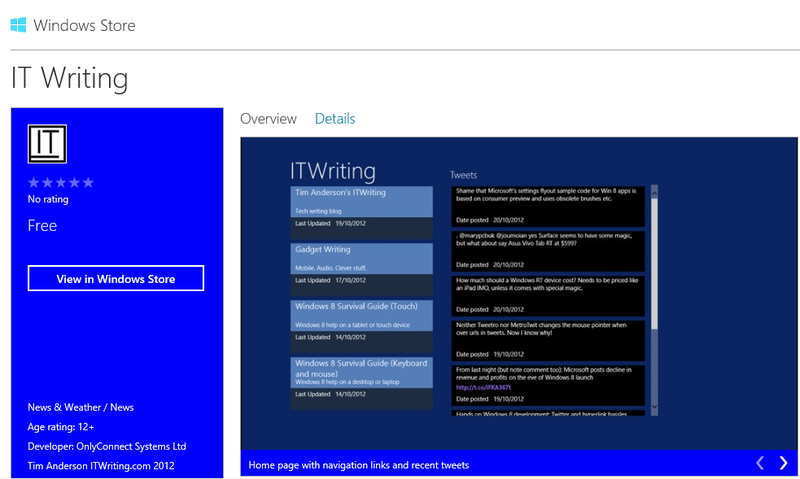 It features quick access to recent posts on itwriting.com and gadgets.itwriting.com, recent tweets, and dedicated links to Windows 8 survival guides for both keyboard/mouse and touch/tablet users. Despite its simplicity, creating the app was an interesting exercise. Having the app layout change in a moderately sensible way when switched between portrait and landscape, and filled or snapped, taught me a bit about XAML and the VisualStateManager element. I also struggled a bit with the flyouts that you use to implement app settings, the ones that appear when the user displays the Charms menu and taps or clicks Settings when your app has the focus. I used the official sample though I discovered that it will not compile as-is because the standard brush names have changed since the release preview for which the sample was apparently created. I have have some sort of z-order bug there which I have not yet solved. Creating apps for Windows 8 is not difficult exactly, but it is fiddly. It seems to me harder than, for example, creating a desktop app using Windows Forms. In mitigation, setup and deployment is done for you which is a significant advantage. I was also pleased to discover that the app works fine on a Surface RT. I do have some ideas for making the app a little more interesting. Share support and offline support would be obvious enhancements. Watch out for future updates!